The most successful teams manage to find ways to win even after less than glamorous performances. In a tight victory over the Goucher College Gophers on Wednesday, February 11th, Catholic University’s men’s basketball team did just that. It was not pretty, the Cardinals trailed for most of the contest, and the shots were not falling. Instead of getting discouraged and taking a bad home loss, Catholic hung around and outlasted its opponent. CUA pushed their winning streak to five games with the 67-63 win over the visiting Gophers at the Raymond A. DuFour Center. The win meant even more because it puts Catholic in first place in the Landmark Conference, all alone with a 10-3 record. After a shaky stretch in the beginning of the winter campaign, the now 17-5 Cardinals look to be gaining momentum at just the right time of the year. The loss drops Goucher to 9-13 overall, and 5-8 in the Landmark. As previously mentioned, it was not the Cardinals’ most impressive performance of the year. The offense struggled to find a rhythm for most of the contest, and some starters dealt with early foul trouble. 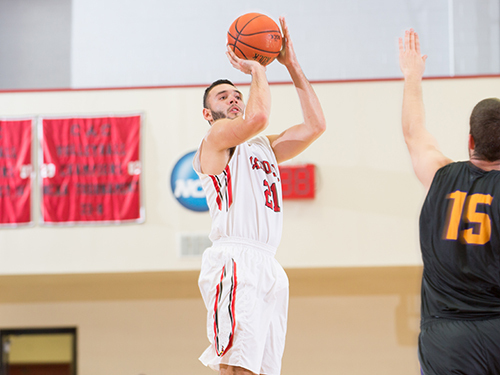 In the first half, CUA saw just 7 of their 27 attempts fall, including 1-8 from 3-point land. The outside shooting struggles would be a theme of the whole game as the back and forth first half ended with a buzzer beater jump shot to put Goucher up 27-25. Senior guard Kyle Phanord commented on the need to have scoring threats from multiple guys on the court if one aspect of the team’s game is struggling. “It’s important to feed guys like Jay (Howard) and Corey (Stanford) when our shots aren’t falling because it establishes that inside presence which allows for wide open and better shots later in the game once teams start doubling down on them,” Phanord said. The offensive game plan did indeed resort to a reliance on the low post game for the forwards to score from close range. This was a plan that sophomore forward Jay Howard had no issues with at all. The 2014-2015 Landmark Rookie of the Year battled against a number of Goucher defenders and made his presence felt all game. Whether it was an isolation drive from the top of the key, or a 1-on-1 post up, Howard created many scoring chances and free throw attempts for himself. Howard ended up with 27 points, one short of a career-high, on 10-19 shooting and 7-10 from the charity stripe. While Howard wasn’t driving down low for baskets, it was senior guard Bryson Fonville creating jump shot chances that only he could make look manageable. Fonville could only play 7 minutes in the first half due to foul trouble, but the All-American contributed 18 of his 21 points in the second half down the stretch. Although he chipped in just 4 points on 1-8 shooting, Corey Stanford pulled down 12 rebounds to help his team. The game saw 10 lead changes, and neither team could sustain a run to give itself a comfortable lead at any point. In a conference game like this, the familiarity of a high pressure moment is crucial. Catholic pressured Goucher on defense and forced 19 turnovers, which resulted in 16 points for the home side. On a night in which the final shooting percentage was 35 (20-57), it would take a gritty effort to just get a win. Catholic took a lead with just under four minutes to play in the contest and battled to retain it. Junior Louis Khouri came off the bench and made his impact with eight points, six rebounds, and two steals in 24 minutes of play. CUA got the stops they needed, and made enough free throws to ice the game. Two made free throws from Khouri with 3 seconds left put the game out of reach for the Gophers, and the Cardinals pulled out the 67-63 victory. Catholic will be in action once again at the DuFour Center on Wednesday, February 17th, at 7 PM against Juniata College.